Wakefield Cathedral01924 373923work CathedralWakefield Cathedral is a landmark building at the heart of the city. Worship began on the site of the Cathedral around Saxon times and the Normans erected the first stone structure sometime in the 11th Century. 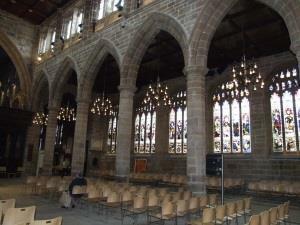 Wakefield, as a town, prospered during the 15th century, thanks to the wool trade and during this period many alterations were made to the building, including extending the aisles and putting in the clerestory windows in order to bring in more light. The replacement paneled roofs with carved and gilded bosses remain intact today. A new tower, surmounted by a spire, was erected at the west end. This spire rises to 247 feet, making it the tallest in Yorkshire. Much of the above work took place during the Wars of the Roses, even while the Battle of Wakefield was being fought nearby, at Sandal Magna (Castle) in 1460. The Cathedral today is the focal point for a busy Northern diocese, eighteenth in size of population which contains towns such as Halifax, Huddersfield, Dewsbury, Barnsley and Pontefract. Wakefield Cathedral is a landmark building at the heart of the city. People come not only for regular worship but also for the big services that every cathedral and civic church has to provide. They also come individually from the adjacent shopping precinct to light a candle and pray or simply just to soak up the peaceful atmosphere. Please check opening times in advance before traveling as services, weddings and funerals will restrict visitor access to the building.